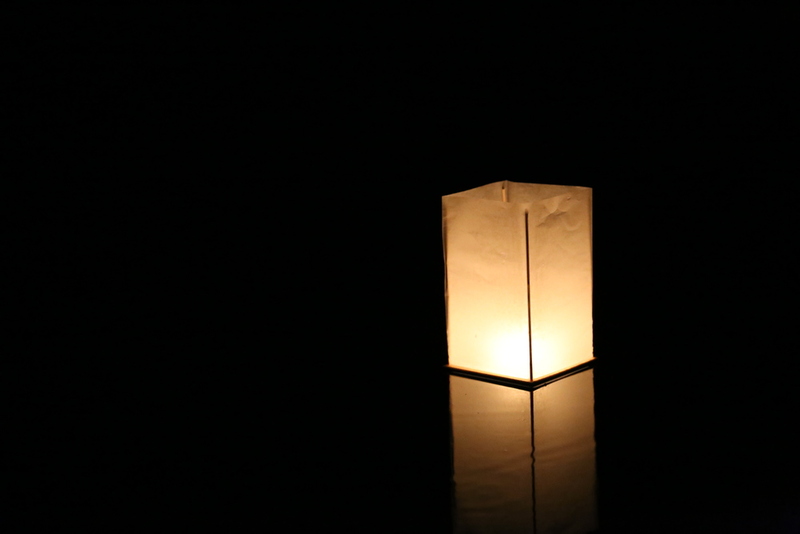 We are proud to announce that Gravitas Ventures is distributing Paper Lanterns! Check out the link below to order on iTunes and if you've seen the film, please be sure to leave a review! Pre Order is available on iTunes and Blu Ray/DVD will be available on Amazon, Best Buy, and other online retailers on 8/7/18! More links as they become available! In the summer of 1945, the United States dropped two atomic bombs on Japan. On August 6th, “Little Boy” was dropped on Hiroshima, and three days later, “Fat Man” was dropped on Nagasaki. Hundreds of thousands of people were killed. What few people know is that 12 American POWs were on the ground in Hiroshima, 1,300 feet from ground zero. Two of the twelve Americans were Normand Brissette of Lowell, Massachusetts, and Ralph Neal, of Corbin, Kentucky. On that same early August morning, a young Japanese boy, Shigeaki Mori, would witness the explosion. He would survive that day, but his life would be changed forever. Mr. Mori would go on to document the events of that day and the thousands that were lost. Through his research, he would find evidence of the 12 American POWs, and would spend over 35 years tracking down their stories. Not as enemies, but as humans that suffered in one of history’s most tragic events. To honor them, like all the others who suffered as victims that day, he worked tirelessly to track down each family and try to give some closure and even solace by letting them know what happened. And to have each airman recognized at the Hiroshima Peace Museum, named as victims of the atomic blast. What would drive this man to spend so much time and effort to recognize them? To reach out to their families and provide comfort. And often closure. And that is exactly what Shigeaki Mori did. Normand and the other Americans were just some of the over 100,000 people that died following the bombing. Normand shared the same fate as the Japanese. His story is their story. But one man has stood up to give the 12 their voice. One man looked at them not as just as a symbol of those that had dropped the bomb, but as victims. They were sons, brothers, husbands and fathers. And they deserved to be treated as such. No matter what uniform they wore. That is Shigeaki Mori's legacy. “Paper Lanterns” is a film about the true story of Normand Brissette, Ralph Neal, and Mr. Mori’s struggle to account for their story in the years and decades that followed the end of World War II. This story is about them. The horrors they witnessed. The families that struggled to find the truth, and one man’s effort to give them the gift of closure. It’s about the humanity and compassion shown by those who were in the heart of the destruction. The generation that lived through these events are dying away. They don’t want anyone to forget their loved ones and the sacrifices they made. They want to strive for peace, compassion and a world free of nuclear weapons. They want us to never forget their story. Tōrō nagashi is a ceremony where paper lanterns are floated down the river in front of the Hiroshima Peace Museum. It is meant to symbolize the spirits departing back to the other world. This ceremony takes place every August 6th. 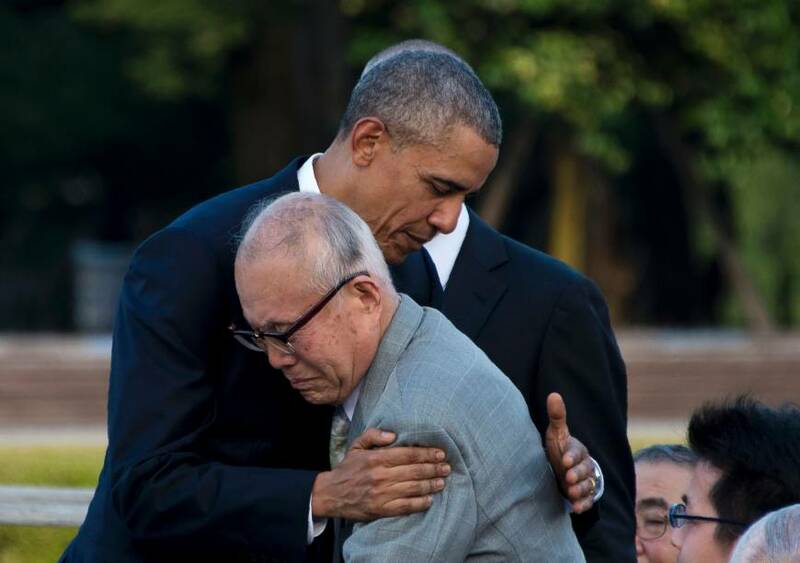 U.S. President Barack Obama hugs Shigeaki Mori, a survivor of the 1945 atomic bombing of Hiroshima, during a visit to the Hiroshima Peace Memorial Park on Friday. | AFP-JIJI. Courtesy of Japan Times. Why do we come to this place, to Hiroshima? We come to ponder a terrible force unleashed in a not-so-distant past. We come to mourn the dead, including over 100,000 Japanese men, women and children, thousands of Koreans, a dozen Americans held prisoner. We continue to share the film around the world. We are now approaching out 30th festival and having just wrapped DocUtah as well as the Global Peace Film Festival in Orlando FL, with more announcements coming. We were also awarded the Best Feature Documentary as well as the Best Score at the Scruffy City Film Festival/Film Score in Knoxville, TN. On June 19th, and again October 18th, we were honored to be invited to United Nations in NYC, to screen the film as part of the Disarmament Conference and then the General meetings. Please read here for more details. In November, the film will be part of the UNITAR/UNODA conference in Hiroshima. On May 27th, 2016 President Barack Obama became the first sitting president to visit Hiroshima. The Mori's were honored by the President for their work on behalf of the American POWs. The image of President Obama and embracing Mori-san defines what this project has been all about. The film and the amazing people in it have really captured the attention of press all around the world. It is amazing to see the emotions that the story of the 12 POWs, their families and Mori-san and his family can bring. Just some of the press articles are below. If you are interested in a screening, please feel free to contact us. Thanks! Mr. and Mrs. Mori are coming to the USA! We've been working hard to get a gofundme program going and we've raised just enough to make it happen! Events are coming together, but we will have 2 public screenings with Mr. Mori and others as special guests. One event will be in Mountain View, CA. Details and link below. The second event will be in Boston, at the Museum of Fine Arts, on May 30th. May 24th Asian Art Museum. San Franciso, CA Event details can be found here. Screening of the film in an incredible venue, with Mr. Mori in attendance. May 25th, 2018. CSMA, Mountain View, CA. Event details can be found here. Screening will include Q and A with Mr. Mori! May 28th, 2018. Memorial Day event in Lowell, Ma. Please join us as the Lowell, MA, Centralville Veterans dedicate a new plaque honoring the 12 Americans killed in Hiroshima. Mr and Mrs. Mori, the Neal family, the Brissette family, the Chandonnet family and representatives from local and state government will be on hand. Event starts at 9AM. Location can be found here. May 30th, 2018. Museum of Fine Arts, Boston MA. Events and tix info can be found here. Screening will include Mr, Mori and other family members. May 31st, 2018. We are proud to announce that the film will be shared at the United Nations in NYC. The event will take place in the afternoon between 3-5 pm. This is event is open to the public, but access will be limited. Please email me if you are interested and I can provide you with a special link. heyitsbarryfrechette@gmail.com. April 14th. Tufts University. Medford Massachusetts. April 19th. Oundle International Festival Documentary Series. Oundle, England. April 21st, Keene, NH. Monadnock International Film Festival. April 30th. San Jose, CA. Silicon Valley Asian Pacific FilmFest. June 16th Park City International Film Festival. July 29th Film Score/Scruffy City Film Festival. July 29th and August 1. September 4-9 DocUtah Film Festival. December 2. Pensacola, Florida. .
October 10th Hot Springs Documentary Film Festival-Arkansas. October 23rd Orlando International Film Festival. October 23rd United Nations Association Film Festival-San Francisco. October 28th Arlington International Film Festival. November 11th Hiroshima International Film Festival. November 10-14th New Haven International Film Festival. November 15 US Japan Council Conference. November 16 Community School of Music and Arts. Sign up with your email address to receive updates as we get our Kickstarter launched and continue with production. We respect your privacy. I won't be sharing anyone's email. @rulebostoncamera @connellypartners . Take RB on the road. When the rooftop shoot works out just right. Reminder of the importance of music when making stuff. Yes, that is me. I felt 6 feet tall in Japan. I'm an ad guy and I've grown up in production. TV ads, videos, websites. All that stuff. But what I really love is helping people make things. When I came across this story, I knew that this was something that really needed to be told. That is why I have jumped in with both feet. The people in the production community and ad community here in Boston have been so incredible thus far. I am very lucky to be around these people. I know it sounds lame to say it, but I am still in this business because of the caliber of the people it attracts. I live just north of Boston, in Billerica, Massachusetts. The real joy in my life is my family. I'd put a picture of my wife up here, but she would kill me. Max is just old enough to remember editing video using VHS tape decks but too young to have a true appreciation for the phrase "cutting room floor." He's successfully circumnavigated the pressures of having a nine to five by freelancing as a filmmaker in Boston working primarily with Mullen and Element Productions. He's reassured his mom that things will be okay, showing her videos he's directed for Google, Velcro, Panera, Foxwoods and Adidas. His mother concedes those video look a bit more professional than the high school track team highlight reels he used to make. Needless to say, although his mother is no longer watching him compete in Division I Track and Field at Boston University, she seems to enjoy dressing up for film festivals and occasionally seeing his work on the New York Times or Sports Illustrated websites. In addition, Max taught an Intro to Visual Journalism class required for all journalism majors at Boston University in the Fall of 2013. In the last couple of years, he's won bronze and silver Hatch Awards and an OMMA Award in the advertising world with Mullen and in the documentary world he co-directed the short doc, The Druid City, an official selection for the Sidewalk Film Festival in Birmingham, AL, the Boston International Film Festival, and winner of the Redstone Film Festival. Chad is a Los Angeles-based composer and orchestrator. He has co-composed music with Ye Xiaogang, one of China’s best-known composers, and has worked with Conrad Pope on orchestrations for OSCAR (c) winners Howard Shore and Alexandre Desplat. The founder of the Asia/America New Music Institute (AANMI), Chad is fluent in Japanese and has led contemporary music events in Thailand, Vietnam, China, Japan, and South Korea. He works closely with UN Messenger of Peace, Midori, on her outreach projects worldwide, including recent projects in Myanmar and Bangladesh. He holds degrees in music from Harvard and Juilliard. Born in Tokyo, singer and lyricist Mai Fujisawa made her debut on screen at age 4, singing Nausicca Requiem, from the soundtrack to Studio Ghibli’s first-ever film, Nausicaa of the Valley of the Wind, written by her father, composer Joe Hisaishi. In 2012, she sang the opening theme of Harry Potter and the Deathly Hallows - Part II, by Alexandre Desplat. Other titles recognized nationally in Japan include Clouds Above the Hill, about the Meiji Restoration, and Ojarumaru. Recently she was named a goodwill ambassador for NAkano City, in Nagano Prefecture, a role that focuses on the revitalization of rural towns through music. Noted by The New York Times as a “virtuosic, deeply expressive shakuhachi player and composer,” Kojiro performs regularly with the GRAMMY nominated Silk Road Ensemble with whom he appears on multiple recordings including Off the Map and A Playlist Without Borders. Born to a Japanese father and a Danish mother, Kojiro grew up in Tokyo. He is a composer of electro-acoustic works, and a technologist with interests in integrating global musical practices with electronics. He is Associate Professor at University of California - Irvine.